Do you spend a lot of time outdoors and find that your phone's battery dies way too fast? Are you tired of your wireless devices' batteries being dead just when you need them the most? Try HYBRID POWER PRODUCTS SUPER FAST CHARGING power bank! Many people already own a less powerful power bank and find their devices don't charge quick enough or the power bank dies too fast. 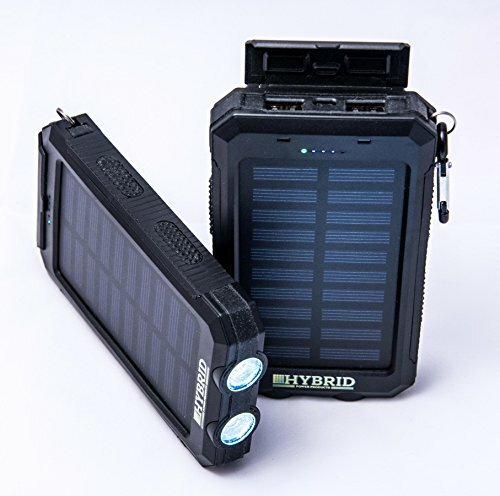 Hybrid Power Products solar power bank is perfect for times when you need an extra boost. This solar power bank battery charger charges multiple devices in no time; over and over! You may wonder why choose HYBRID POWER PRODUCTS over the others. The answer is first and foremost INTEGRITY. There are many companies that advertise capacities of 10,000 mAh, 15,000 mAh, 20,000 mAh, etc. but the internal true capacity is 8,000 mAh. This means the print on the outside of the device does not match the internal battery capacity. Most consumers won't break open the device to validate but we have researched and found this to be true for many devices. HYBRID POWER PRODUCTS does not falsely advertise the true capacity of our device. The capacity in our power bank is more than adequate to fully charge iphones, androids, tablets, speakers and many other USB chargeable devices. We understand that it's reflected in our brand to deliver a durable, well tested, quality product while maintaining truth and transparency always. Our solar charger is protected in a dustproof, shockproof and waterproof hard shell case with rubber corner protection and anti-slip finger grips on the sides. It is capable of charging two devices at the same time using its dual charge function. It comes with a carabiner which you can use to hook it to your purse, back pack, golf bag, etc. as well as a built in compass. It also has a super bright dual LED flashlight which has two brightness settings and an emergency flashing feature.Buy from Hybrid Power Products, the brand that cares about the consumer and will always speak the truth! EXTREMELY VERSATILE - This lightweight power bank works great for cell phones, bluetooth headsets, bluetooth speakers, GoPro cameras, digital cameras and many more. It is also is equipped with a built in compass as well as a torch light with two brightness levels and a steady or strobe option! DESIGNED TO KEEP YOU MOVING - This is perfect for people on the go. Don't be fooled by false advertising, 8000 mAh is the Industry's REAL maximum battery capacity..Recommended for anyone who needs to be powered up for extended periods - to keep your devices charged for when you really need them! ECO FRIENDLY AND SHOCK RESISTANT - Designed for rugged use, our battery pack is made with eco friendly silicone rubber, ABS and PC material! The power bank is also protected in a shock resistant shell with rubber corner protection and anti-slip finger grips on the sides! DUAL CHARGER - Tired of waiting on one device to finish charging when you have multiple that are low battery? Our portable charger has dual ports, making charging all your devices much easier! SHORT CIRCUIT PROTECTION - This power bank is equipped with overload, overcharge and short circuit protection, making sure that even with technical issues, your power bank does not break or become corrupted. If you have any questions about this product by Hybrid Power Products, contact us by completing and submitting the form below. If you are looking for a specif part number, please include it with your message.